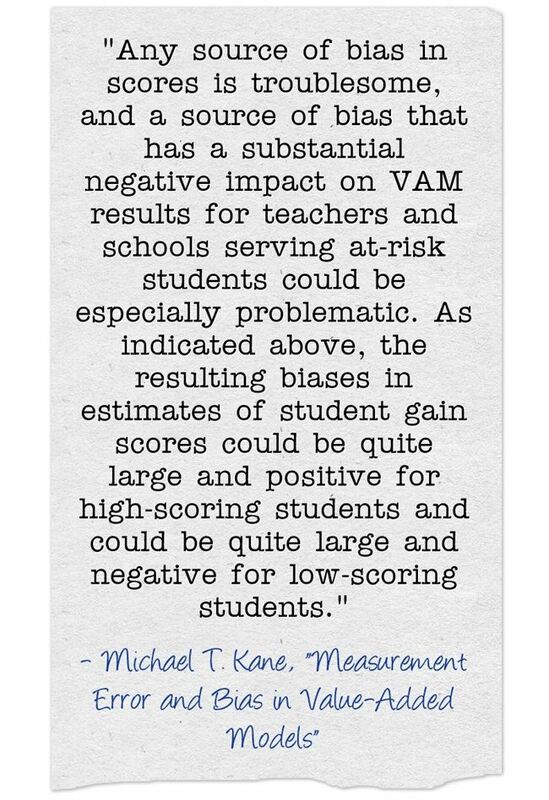 There are lots of problems with VAM (Value Added Models, though I’ve also see the “M” stand for “Measurement”) being used for teacher evaluation. You can read about them at The Best Resources For Learning About The “Value-Added” Approach Towards Teacher Evaluation. A new study has added to that evidence. So, it sounds like VAM is biased towards teachers of middle-and-higher income students, and against those of us who teach students experiencing socio-economic challenges. In districts using VAM, this finding will certainly make schools in low-income communities even more difficult to staff…. The message being sent is that the kids in low-income communities need to be treated less than the high income communities. Sometimes I think the message is that the at risk kids don’t have a chance to improve so we should leave them all behind and throw them all away – along with their teachers. It is all backwards and upsides down.